Since Rashmi and Akshay gave birth to their new born baby boy they have been suffering as their baby was born premature with severe lung problems and as now been in the ICU on ventilator support for the last 6 months. 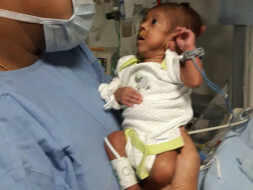 The baby is still in a critical condition and will need to remain in the ICU for the next 3-4 weeks in order to recover. 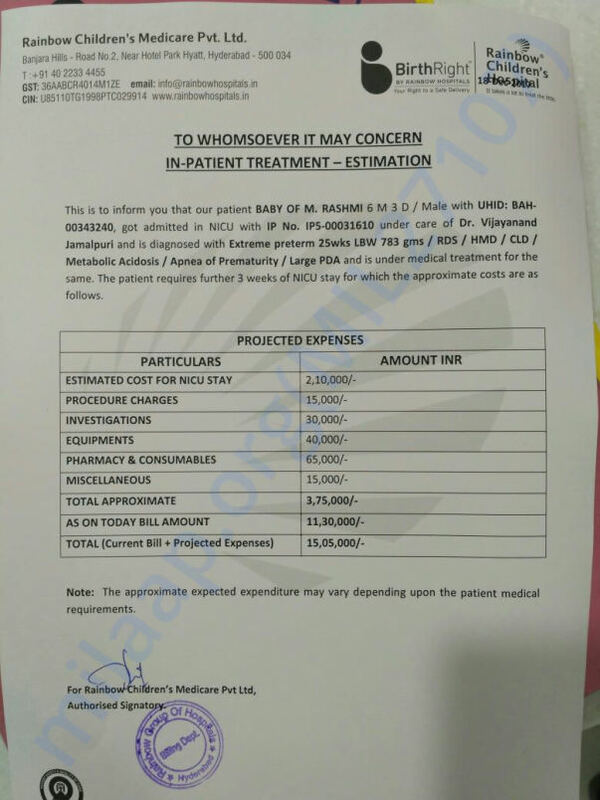 The total cost of the treatment is around 8 lakh Rs. Unfortunately, this is far too high for Rashmi and Akshay to afford and they need our help. Thank you for all the support that you have shown towards my daughter. She is doing better now compared to earlier and her health is also improving. Based on her health and stability she was discharged from the hospital on 23rd January. We are currently at home and the doctors have suggested that she will be needing low flow oxygen support and we have a nurse at home to tend to her. Her weight has also increased to 4 kilograms now. The doctors suggest that she will be needing another surgery in about 3 months to close the opening from where the oxygen is being administered to her. I would like to thank all of you for all the love and support that you have shown towards my daughter. We did not know from where we would be raising funds for her treatment. Your support and blessings have helped her in recovering faster. 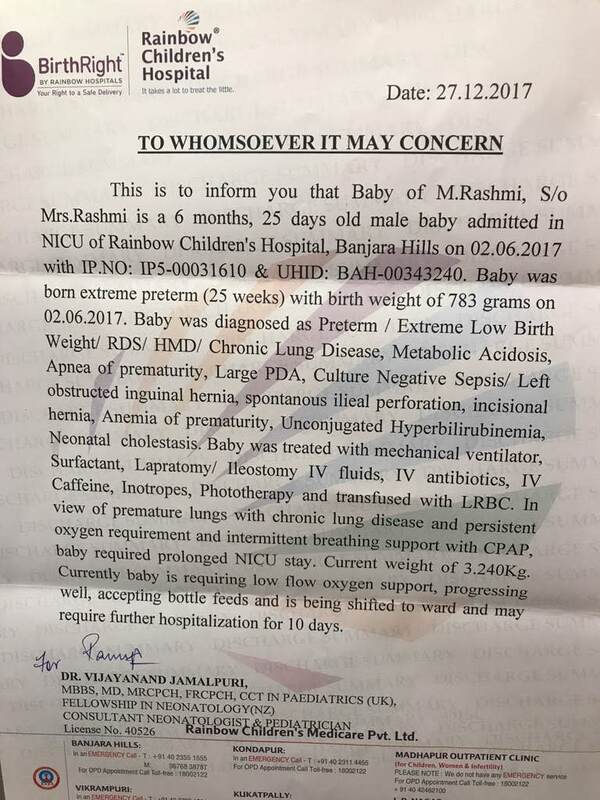 Here is an update on Rashmi's baby. 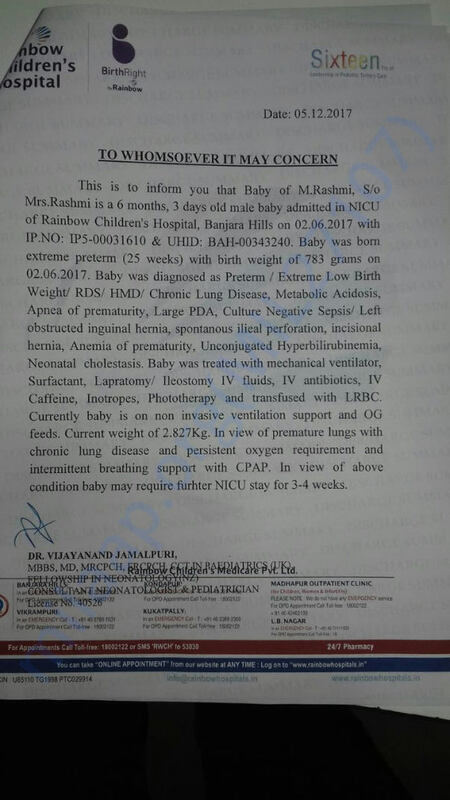 The baby boy is currently in ICU and is being provided low flow oxygen in the hospital. Baby is undergoing treatment for desaturation and for weight gain. The doctors are of the opinion that baby has to remain in the hospital for further treatment and recover completely. Please find the attachment of the estimation letter below. Please share the campaign with your friends and family to support the baby. Thank you for your support and love for the baby. Please keep him in your prayers.